Not to be confused with Popular Front for the Liberation of Palestine. The Democratic Front for the Liberation of Palestine (DFLP) (Arabic: 'الجبهة الديموقراطية لتحرير فلسطين', transliterated Al-Jabha al-Dimuqratiya Li-Tahrir Filastin) is a Palestinian Marxist–Leninist, secular political and militant organization. It is also frequently referred to as the Democratic Front, or al-Jabha al-Dimuqratiyah (الجبهة الديموقراطية). It is a member organization of the Palestine Liberation Organization. The group maintains a paramilitary wing called the National Resistance Brigades. Although the National Resistance Brigades have fighters based in both the West Bank and the Gaza Strip, these fighters have been engaged in relatively few military operations since the Second Intifada. The National Resistance Brigades continue to take part in training exercises at paramilitary camps near Rafah and Khan Yunis. One of the attacks for which the DFLP is best known is the 1974 Ma'alot massacre in which 25 schoolchildren and teachers were killed. PDFLP poster, the caption of which reads: "Solidarity with the people of the Middle East in their struggle against imperialism, feudalism, Zionism and Arab reaction"
In 1968, a faction of the left-wing Popular Front for the Liberation of Palestine (PFLP) broke away from the main organization to form the Popular Democratic Front for the Liberation of Palestine (PDFLP). The PDFLP was headed by Secretary-General Nayef Hawatmeh, who had been referred to as a leader of the PFLP's Maoist tendency. He believed that the PFLP had become, under the guidance of George Habash, too focused on military matters, and wanted to make the PDFLP a more grassroots and more ideologically focused organization. By contrast, Ahmad Jibril's Popular Front for the Liberation of Palestine – General Command (PFLP-GC), which split away from Habash's organization in 1968, wanted to focus more on the tactical implementation of armed struggle. In May–June 1969, the Palestinian Revolutionary Left League and the Palestine Popular Liberation Organization merged into PDFLP. The PDFLP soon gained a reputation as the most intellectual of the Palestinian fedayeen groups, and drew heavily on Marxist-Leninist theory to explain the situation in the Middle East. Its other leaders included Yasser Abed Rabbo. The DFLP declared that its goal was to "create a people's democratic Palestine, where Arabs and Jews would live without discrimination, a state without classes and national oppression, a state which allows Arabs and Jews to develop their national culture." The PDFLP's original political orientation was based on the view that Palestinian national goals could be achieved only through revolution of the masses and "people's war". However, it would soon come around to a more moderate standpoint and while preserving a hard-line attitude to armed struggle, the party began theorizing on various compromise solutions. DFLP was badly hit by the 1970 September crack-down in Jordan (Black September). The offices of its Amman-based publication Al-Charar was bombed and burned by Jordanian tanks. From the mid-1970s, the group occupied a political stance midway between Yasser Arafat and the PLO hardliners. The DFLP condemned attacks outside Israel (such as the aircraft hijackings for which the Habash PFLP gained notoriety) and was essential in making the binational state the goal of the PLO in the 1970s, insisting on the need for cooperation between Arabs and Jews. Still, while pioneering Palestinian-Israeli peace talks through making early contact with Jewish and Israeli peace campaigners, including Matzpen, the DFLP simultaneously conducted numerous small bombings and minor assaults against Israeli targets, refusing to give up the armed struggle. The Ma'alot massacre of 1974, an attack on Israeli school in which 27 people were killed, was the group's largest attack. In 1974, the same year as the PDFLP changed its name into the Democratic Front for the Liberation of Palestine (DFLP), it acted as a strong supporter of the 1974 Ten Point Program. This document, which was accepted by the Palestinian National Council (PNC) after lobbying by Fatah and DFLP, cautiously introduced the concept of a two-state solution in the PLO, and caused a split in the organization leading to the formation of the Rejectionist Front, where radical organizations such as the PFLP, PFLP-GC, Palestine Liberation Front and others gathered with the backing of Syria, Libya and Iraq to oppose Arafat and the mainstream PLO stance. In 1974 the organization perpetrated a major terror attack in Israel, when attacking a local elementary school in the village of Ma'alot. Taking the school-kids for hostage, 22 children aged 14–16 years-old were killed when an army commando engaged them. In 1978 the DFLP temporarily switched sides and joined the Rejectionist Front after clashing with Arafat on several issues, but it would continue to serve as a mediator in the factional disputes of the PLO. In the tense situation leading up to the 1983 Fatah rebellion, during the Lebanese Civil War, the DFLP offered mediation to prevent the Syrian-backed formation of a rival Fatah leadership under Said al-Muragha (Abu Musa), the Fatah al-Intifada faction. Its efforts ultimately failed, and the PLO became embroiled what was in effect a Palestinian civil war. 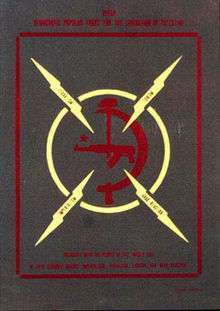 From the early 1980s the DFLP was seen as the most pro-Soviet and pro-Chinese of the PLO member organisations. The collapse of the Soviet Union and the growing Islamist trend in Palestinian society during the 1990s sapped the party of much of its popularity and resources. The Chinese leader Deng Xiaoping also began to reduce the PRC's support for revolutionary struggles abroad throughout this period so as to reduce the damage it caused to trade relations with the West. The DFLP continued to cautiously support Arafat's attempts to open negotiations with Israel, but this was not uncontroversial within the membership. The First Intifada (1987–93) provoked a shift in Palestinian politics towards the Occupied Palestinian Territories, which proved a severe handicap for the largely diaspora-based DFLP. With the swift rise of Islamism and religious groups such as Hamas in the 1980s, the DFLP faded among the Palestinian youth, and internal confusion over the future path of the organization paralysed political decision-making. In 1991 the DFLP split, with a minority faction led by Yasser Abd Rabbo (who had become increasingly close to Yasser Arafat) favouring the Madrid negotiations that led initially to limited Palestinian autonomy in the West Bank and Gaza Strip. Inspired by the USSR's Glasnost and the fall of the Berlin Wall, this group also favored a new political orientation, focused less on Marxism and armed struggle, and more on the democratisation of Palestinian society. It reconstituted itself as the Palestine Democratic Union (FIDA), and Abed Rabbo was officially made an advisor of Arafat. There were reports of armed clashes between the factions in Syria during the split. Essentially the Damascus-headquartered DFLP under Nayef Hawatmeh was able to retain its external branches, whereas the majority of the organization within Palestine, mainly on the West Bank, was taken over by FIDA. The DFLP, under Hawatmeh, joined the rejectionist groups to form the Alliance of Palestinian Forces (APF) to oppose the Declaration of Principles signed in 1993. The group argued that the Oslo negotiations were undemocratic, excluded the PLO from decision-making and deprived the Palestinians of their legitimate rights, but in contrast to most other Alliance members they did not oppose a two-state solution as such. Along with the PFLP, it then broke from the APF over ideological differences, and has made limited moves toward merging with the PFLP since the mid-1990s. In 1999, at a meeting in Cairo, the DFLP and the PFLP agreed to cooperate with the PLO leadership in final status negotiations with Israel. In October 1999, the group was dropped from the United States' list of terror organizations. The DFLP was subsequently represented in the Palestinian delegation at the unsuccessful Camp David negotiations of July 2000. The DFLP has been largely unable to make its presence felt during the al-Aqsa Intifada, which began in 2000. The leadership is stationed in Damascus, and most of the DFLP organization on the Occupied Territories unraveled in the FIDA split. Its military capacity has been fading fast since the 1993 cease-fire between the PLO and Israel, which the DFLP respected despite its objections to the Oslo Accords. Since the beginning of the second Intifada the DFLP has carried out a number of shooting attacks against Israeli targets, such as the 25 August 2001 attack on a military base in Gaza that killed three Israeli soldiers and wounded seven others. However, its military capabilities in the Occupied Territories remain limited, and the refocusing on armed struggle during the Intifada has further weakened the organization. On September 11, 2001, an anonymous caller claimed responsibility for the September 11 attacks in the United States on behalf of the DFLP. This was immediately denied by Nayef Hawatmeh, who strongly condemned the attacks. Although the accusations gained some attention in the days following the attacks, they are now universally regarded as false. The DFLP ran a candidate, Taysir Khalid, in the Palestinian Authority presidential election in 2005. He gained 3.35% of the vote. The party had initially participated in discussions with the PFLP and the Palestinian People's Party on running a joint left-wing candidate, but these were unsuccessful. It won one seat in the 2005 PA municipal elections. In the 2006 elections to the Palestinian Legislative Council, the Front formed a joint list called al-Badeel (The Alternative) with Palestine Democratic Union (FIDA), the Palestinian People's Party and independents. The list was led by the historic DFLP leader Qais Abd al-Karim (Abou Leila). It received 2.8% of the popular vote and won two of the Council's 132 seats. The DFLP retains important influence within the Palestine Liberation Organization (PLO). It was traditionally the third-largest group within the PLO, after Fatah and the PFLP, and since no new elections have been held to the PNC or the Executive Committee since 1988, the DFLP still commands important sectors within the organization. The PLO's role has admittedly diminished in later years, in favor of the Palestinian National Authority (PNA), but it is still the recognized representative of the Palestinian people, and a reactivation of the PLO's constitutional supremacy over the PNA in connection with power struggles in Palestinian society is a distinct possibility. The DFLP held its 5th national general congress during a time-span from February to August 2007. The congress was divided into three parallel circle: West Bank, Gaza strip and the Palestinian exiles. The congress elected a Central Committee, with 81 full members and 21 alternate members. The DFLP is primarily active among Palestinians in Syria and Lebanon, with a smaller presence in the West Bank and Gaza Strip. Its Jordan branch has been converted into a separate political party, the Jordanian Democratic People's Party (JDPP or Hashd), and the DFLP is no longer active on the political arena there. The DFLP mainly attracts Palestinians with a more socially liberal and secular lifestyle, as well as Palestinian Christians, primarily in cites like Nablus, and Bethlehem. The party publishes a weekly newspaper in several Arab countries, al-Hurriya (Liberty). The DFLP is believed to receive limited financial and military aid from Syria, where it is active in the Palestinian refugee camps. The DFLP's leader, Nayif Hawatmeh lives in Syria. The DFLP is not listed as a terrorist organization by the United States government or the United Nations. It was dropped from the U.S. State Department list of Foreign Terrorist Organizations in 1999, "primarily because of the absence of terrorist activity, as defined by relevant law...during the past two years." ↑ Palestinian National Authority: The PA Ministerial Cabinet List: April 2003 – October 2003. Jerusalem Media and Communications Center. Archived on 27 September 2007. 1 2 "Profile: DFLP". BBC News. 2002-02-04. Retrieved 2009-09-10. ↑ Burke, Jason (2001-08-26). "Attack on Gaza army base kills three". The Guardian. London. Retrieved 2010-05-01. 1 2 EU-Turn. "Institut MEDEA". Retrieved 13 January 2016. ↑ "ISO Statement on Attacks in New York and Washington, D.C.". Retrieved 13 January 2016. ↑ "dflp-palestine.org". Retrieved 13 January 2016. ↑ "1999 Report Index". U.S. State Department. 8 October 1999. Retrieved 9 March 2010. Patterns of Global Terrorism, 1998. United States Department of State, April, 1999. Democratic Front for the Liberation of Palestine – Official English language web page.